The Pathways Fund Helped Nearly 200K Students Get to and Through College. Here’s How. The story of the Pathways Fund, which is sunsetting this year, is an extraordinarily important one for the New Profit community. Together with our amazing partners (see above graphic) we built Pathways and helped catalyze the new and growing college-to-career success field, achieving large-scale results for young people from under-resourced communities and creating a learning lab for a collaborative, multi-faceted approach that is crucial to social problem solving. Everything we are doing today at New Profit to break down systemic barriers to opportunity in America is informed by the lessons we learned from Pathways. Over the next few weeks, we are going to be rolling out the story of Pathways, highlighting the amazing organizations that were a part of it, and sharing lessons learned from the whole initiative. Pathways was created in 2010 as part of the Social Innovation Fund (SIF) in reaction to a stark challenge facing America: access to the education needed for sustainable employment still eludes America’s low-income communities. The SIF, a program of the Corporation for National and Community Service, empowers organizations to identify and support sustainable solutions that are already making a significant impact in transforming communities. 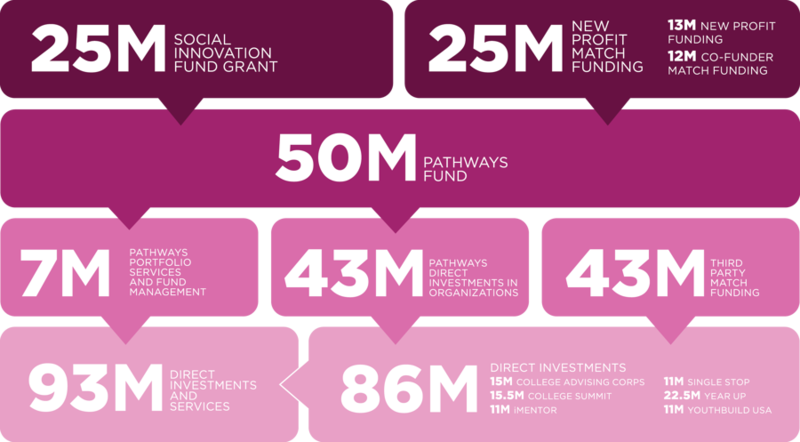 New Profit received a $25 million, five-year SIF grant to partner with a community of co-funders and six innovative nonprofit organizations for a groundbreaking college-to-career success effort: The Pathways Fund. Collectively, the Pathways organizations leveraged SIF funding to dramatically scale the lives and communities served, build and strengthen collaborations to better meet their beneficiaries’ needs, help drive key legislation and policy innovations, and significantly increase the evidence level and capacity of their own organizations and the field more broadly. The significant accomplishments of the Pathways Fund have demonstrated many opportunities philanthropy has to make significant change, and also generated key learnings for the roles funders can play to catalyze and amplify the important work being done on the ground. Through Pathways, New Profit saw the potential of connecting key actors in the same field to develop a learning community; driving systemic impact through aligned action, policy, and other approaches; and increasing opportunities for co-funder engagement. Issue-specific “focus funds” are now core to New Profit’s strategy and operating model. For the field and sector more broadly, we have learned through Pathways about what it takes to achieve massive results in a short period of time while remaining faithful to a variety of outcomes and stakeholders. We are excited to release a final fund report on the Pathways experience and organizations, including key accomplishments and lessons learned over the five-year initiative: “Pathways To Opportunity: Final Report of New Profit’s Pathways Fund 2010-2016.” Our hope is that other practitioners, funders, policymakers, and thought leaders will apply and build on the successes and lessons of the Pathways Fund to continue spurring innovation and progress. Stay tuned for additional blog posts in the following weeks that dig deeper in the report findings, including how New Profit has integrated learnings from Pathways and suggestions for the field. Click here to read the full Pathways report.